a book review by Rita Lorraine Hubbard: I Hate Picture Books! As young readers get older, they typically graduate from picture books to largely pictureless chapter books. 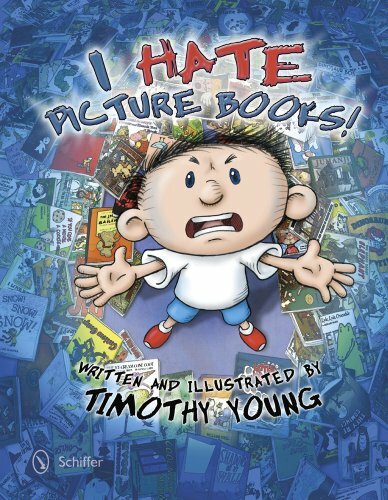 This is what happens in author/illustrator Timothy Young’s newest picture book I Hate Picture Books!—only the reader in this book is trying to graduate before he’s ready. In the story, a young boy vows to get rid of his picture books because they constantly get him into trouble. A picture book about a boy scribbling on the wall with a purple pen gets him into trouble for daring to scribble on his own wall. A book about the delicious taste of unsightly green food (Green Eggs and Ham) convinces him that it’s okay to try a piece of green ham from his refrigerator, but this only leads to a vomiting episode. And a book about a bedroom that transforms into a forest (Where the Wild Things Are) disappoints him when he is unable to “wish” his own room into a forest. The boy is suddenly faced with the harsh reality that goes hand-in-hand with growing up: Toy bears can’t talk; cows can’t type; and hungry caterpillars don’t eat salami or cheese. Thus disillusioned, he tosses his picture books—one by one—into the trashcan . . . until he gets to the P. D. Eastman classic, Are You My Mother? Only then does he realize that he just might be acting too hastily. The premise of I Hate Picture Books! is quite charming and can easily whisk children and their parents back to a kinder, gentler time when picture books were the national pastime in family households. The idea of a youngster throwing a tantrum because his picture books have lost their magic then suddenly realizing he doesn’t want to part with his favorite picture book after all is absolutely adorable. That being said, this book presented a few content challenges that should be addressed. First, the story seems quite wordy for a 32-page 441-word picture book. Next, the vernacular (“’cause” for “because) and rocky sentences (“But the worst thing, there’s this book about this baby bird . . .”) that appear throughout the book detract from its charm and leave the reader feeling . . . well, bombarded with words. One other observation: The books being tossed away in this story are apparently popular and/or classic children’s books, and there is an unspoken assumption that these books are easily recognizable. Unfortunately, unless the reader is a picture book historian, he/she may not recognize the “cow book,” the “crayon book,” or the “pigeon driving a bus” book, to name a few. This then may compel readers to spend too much time trying to figure out which books the author is referencing, further detracting from the reading experience. Children and their parents will enjoy this book for its simple premise, its rich and colorful illustrations, and its funny storyline, but seasoned and serious picture book readers who regard the format as a precise art form may find this book a bit lacking in presentation.